International Monetary Fund Managing Director Christine Lagarde (C), First Deputy Managing Director David Lipton (L) and Communication Department Director Gerry Rice (R) hold a press conference at the start of the IMF/World Bank Annual Meetings October 10, 2013 at the IMF Headquarters in Washington, DC. 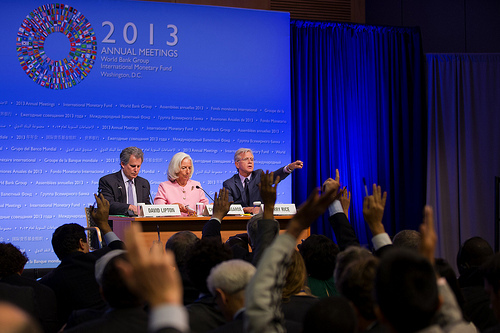 IMF Photograph/Stephen Jaffe. International Monetary Fund managing director Christine Lagarde, in a Press conference held yesterday in Washington, ahead of the 2013 annual meetings of the World Bank and IMF set to take place this weekend, chose to directly confront Germany over the Greek Gordian knot. She repeated three times that the Greece’s Eurozone partners have reiterated on several occasions their commitment to cut down its debt to sustainable levels, as agreed one year earlier, in October 2012. The statement was so clear and loud that leaves no doubt about what the IMF has to say to its Eurozone interlocutors, during the next audit round on Greece’s economic situation. Within this month the troika of EC-ECB-IMF is expected to visit again Athens to assess Greece’s economy. In view of that Lagarde had a lot more to say. Given Eurogroup’s hardening stance towards Athens, reflecting Germany’s position, IMF’s managing director appeared standing on the other side of the fence. Lagarde not only confirmed that Greece is to produce this year a primary surplus, but she added that there won’t be any more horizontal cuts on wages and pensions next year. In this respect the IMF appears much more sensitive to Greece’s woes than its Eurozone partners, mainly Germany. At this point it has to be reminded that exactly twelve months ago, when Athens was negotiating with Eurogroup and IMF a second support package, the Greek government promised to zero its fiscal deficit during 2013. In exchange, its Eurozone partners said that if this condition is met, they will cut down to sustainable levels the country’s debt held by their exchequers and central banks. To be noted that Germany, including Deutsche Bundesbank, holds the largest part of the outstanding Greek debt and a possible haircut on it, would have to be treated as a loss. In reality this would be only a book loss, much less than the nominal reduction of the loans. This summer however, when it became clear that Greece could deliver on its promise and produce not only a balanced budget but actually a primary surplus albeit small, Germany had difficulties accepting to honour its side of the deal, that is cutting down the nominal value of the Greek bonds it holds. The issue became a friction point during the pre-election period in Germany. This country’s voters, well-known for their miser attitude, would punish any politician who is ready to give out money to foreigners, God forbid to lazy Greeks, even if it’s not for real, but just a forfeiting of super gains their country makes on Greek bonds. Chancellor Angela Merkel and the Federal minister of Finance Wolfgang Schaeuble were cornered on this issue by the opposition leaders on many occasions before the 22 September election. At the end they promised to taxpayers that Germany would not accept to cut down the nominal value of the Greek bonds that Berlin holds. At the same time though they both accepted that the Greek debt is unsustainable and the country would need a third loan package some time towards the end of 2014. In this way Germany concedes to participate in this eventual third loan package to Greece, of course conditioning it on more austerity. The reason is that Berlin cannot accept a haircut on the Greek bonds it holds. Lower interest rates? Yes. Longer maturities? Yes. No haircut please, we are Germans! Greece however, backed now by IMF doesn’t accept this arrangement and demands that Germany honours its October 2012 promise and cuts down the Greek debts it holds to levels that can be regularly serviced. This position was hardened by a leak to Wall Street Journal recently, disclosing the discussions in the IMF directors’ conference, at the time when it was negotiated the first loan package to Greece in 2010. Many IMF directors termed that loan package an unjust burden not an aid scheme for the Greek people, bailing out 100% the German banks, which had an oversized exposure to Greece. In reality with that 2010 first loan package to Athens, the Greek people undertook the obligation to compensate the German banks 100/100 for their carelessness to lend tens of billions to Greek banks and governments during the 2000s. The German lenders didn’t lose one cent in that arrangement. Obviously this arrangement cannot continue. Yesterday Lagarde appeared quite determined to teach Germany a long vision lesson. Everybody sees, except the Germans, that Greece cannot tolerate more austerity. The country’s political and social structures have reached their limits and cannot withstand any more of the same cure. If Germany can’t see the catastrophic ending of its policies, it seems that the IMF has decided to ‘convince’ Berlin to change course. « Who may profit from the rise of the extreme right in the West?